Although Swedish automaker Volvo is known for its wagons and—more recently—its SUVs, it also produces sedans that are just as gorgeous and technologically advanced, such as the midsize S90. The latest generation has been on sale for a few years now, and since 2018, it’s only available in Canada in long-wheelbase format. That’s simply because the S90 we get comes from a Chinese assembly plant, and that country is unusually fond of stretched sedans. It takes a keen eye to spot a regular-wheelbase, 2017 S90 on the road, which differs only by the length of its rear doors. 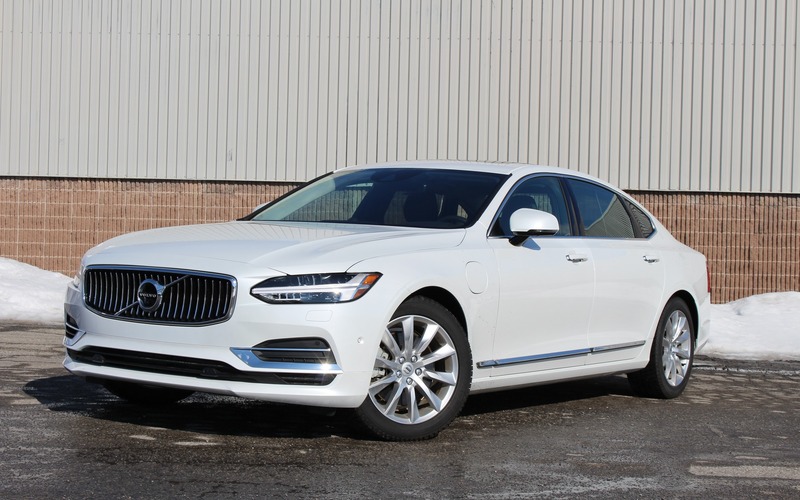 The 2018 Volvo S90 has the difficult task of battling the Audi A6, the BMW 5 Series and the Mercedes-Benz E-Class, three very competent luxury sedans. Yet unlike the German trio that offer a wide variety of powertrains, including twin-turbo V8s that produce upwards of 600 horsepower, every Volvo is equipped with a 2.0-litre four-cylinder engine—albeit with several output levels. From a rational standpoint, it makes sense. On our market, the base turbocharged engine is called the T5 and delivers 250 horsepower, while the T6 gets a supercharger and a turbo to produce 316 hp. The range-topping T8 adds a plug-in hybrid system with an 87-hp electric motor, boosting combined output to 400 hp. Volvo’s media website actually states 402 horsepower while its public site says 400, but that’s a minor detail. The T8 powertrain also dishes out a combined 472 pound-feet of torque, which should normally provide the S90 with fast launches. True, the big sedan is no slouch off the line, and Volvo announces a 0-100 km/h time of 4.8 seconds, but that’s with the Dynamic drive mode activated. Otherwise, the drivetrain is in no hurry to spool up maximum power, and the S90 doesn’t feel as fast as the numbers suggest. Not a big problem, since the car’s mission is to be smooth, quiet and comfortable above all else. And it is, even though the four-cylinder engine will never emulate the refinement and muscle of a good six-piston unit. By plugging the 2018 Volvo S90 T8 eAWD into a 240-volt outlet, the battery pack can be fully charged in three hours and provides a maximum EV driving range of 34 kilometres. It isn’t all that much, but the BMW 530e xDrive’s EV range is set at 24 km, while the redesigned 2019 Audi A6 and its mild hybrid powertrain can’t be plugged in at all. The Mercedes-Benz E-Class also doesn’t offer a PHEV variant right now. Yes, the S90 can cover about 30 km without using a drop of super unleaded fuel, but as is the case with all plug-in hybrids, as soon as we hit the highway, the electric powertrain quickly runs out of juice due to our higher speed. Still, for running errands around town, which includes stop-and-go driving, the Volvo can be quite efficient. Combined city/highway consumption is rated at 8.1 L/100 km, and we recorded an average of 6.3 L/100 km during our test by plugging the car in every night. The 2018 Volvo S90 stands out from the crowd of conservatively styled German sedans for its design inside and out. There’s plenty of room inside, although the low roofline cuts in on headroom. The long wheelbase results in a roomy rear-seat area, and the passenger-side occupant benefits from power controls to move the front seat forward and get even more comfortable. As in pretty much every Volvo, the seats are amazingly supportive and figure among the best in the business. The company’s Sensus infotainment system includes a nine-inch touchscreen that looks pretty slick, but would benefit from being more responsive to finger poking. The system’s processing power is also underwhelming, as functions such as activating the seat and steering wheel heaters are slow to appear on screen. Almost all climate settings must be controlled on screen, which is a multi-step process and very distracting while driving. In winter, the system is even slower. At least there are a lot of features, and Apple CarPlay/Android Auto integration is standard. On the other hand, the fully digital driver instrument panel is easy to read and includes turn-by-turn navigation directions, so that’s good. The optional Bowers & Wilkins sound system in our Inscription test car was delightful, and a Volvo mobile app is available to remotely start the car, unlock the doors and send a destination to the car’s navigation system. The S90, which includes all-wheel drive in Canada, starts at $59,950 before freight and delivery charges, undercutting the German sedans by a few thousand dollars. The T8 eAWD Inscription variant checks in at $74,950, eligible for a government rebate of up to $2,500 in British Columbia and up to $4,000 in Quebec. The BMW 530e xDrive costs about $3K less before options. There’s a lot to like in the 2018 Volvo S90. It’s smooth and extremely comfortable, providing a soothing driving experience that we assume many luxury-car buyers are looking for. However, the T8 plug-in powertrain isn’t a must-have option and doesn’t make the sedan more enjoyable, especially if we’re frequent highway drivers. There are also some reliability and build quality issues, as Volvo ranks well below average in J.D. Power’s Initial Quality Survey. Besides the awesome seats and the seductive design, there’s nothing here to give the German brands a cold sweat, but just a few years ago, Volvo wasn’t even a contender in the midsize luxury-car segment, so it now must be considered as a strong rival. 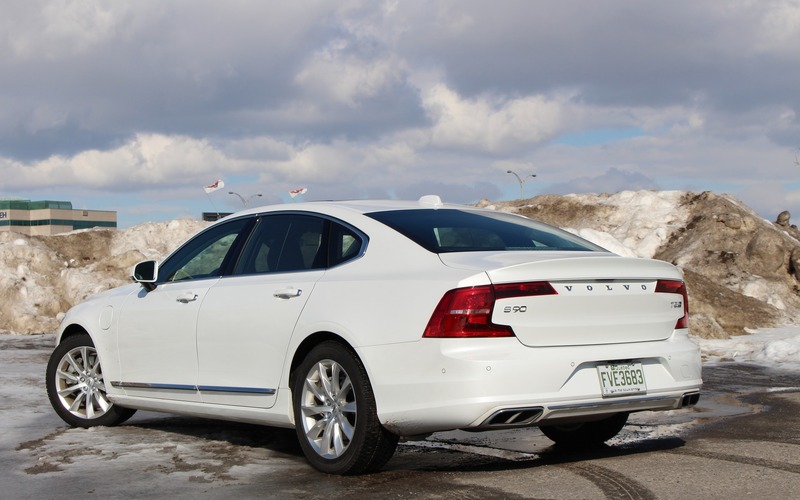 8/10	If we regularly drive around town, the S90 T8 can be quite efficient. 9/10	Fabulous seat comfort and support. 7/10	Fast in Dynamic mode, the S90 T8 otherwise doesn’t feel as speedy as its powertrain output suggests. 6/10	A slick design, but the interface is distracting to use and the system could be faster. 7/10	Good handling, although not as exhilarating as its German sedan rivals. 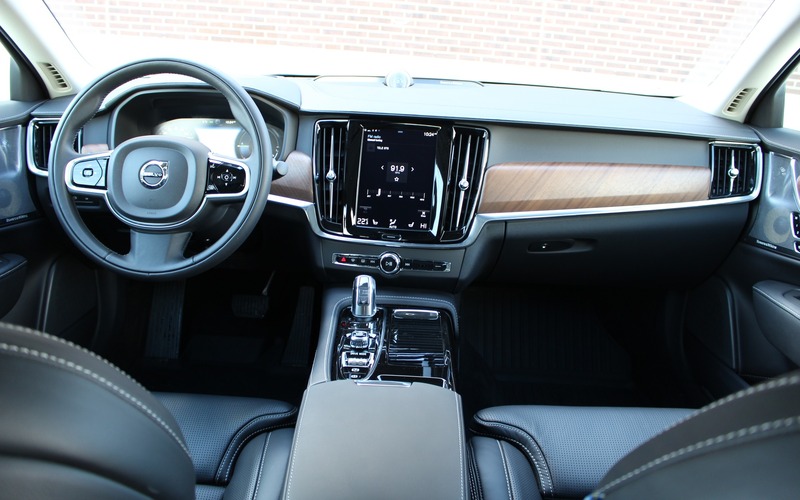 8/10	The S90 stands out with its interior and exterior design and its great seats. However, the T8 plug-in hybrid powertrain isn’t a must-have option.